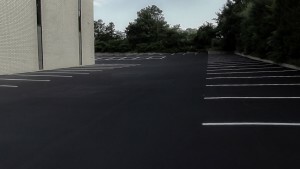 We seal coat complete Parking Lots of any size. We power clean the surface with power blowers and steel brooms. 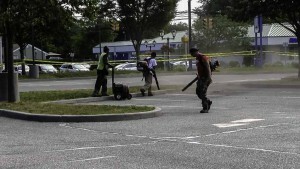 The cleaner we get your pavement, the better the Parking Lot Sealer will adhere to the asphalt surface. This will result in a long lasting coat. The Sealcoating (Coal Tar Emulsion or Asphalt Emulsion depending on the County) is machine mixed on site. We add sand with the sealcoating material for a skid resistant surface. 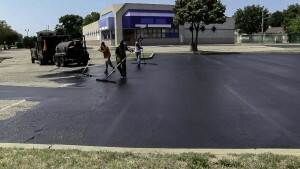 We apply sealcoating by hand with a brush for neatness and to make a better contact with the asphalt pavement. The parking lot can then be re-striped to ADA code.